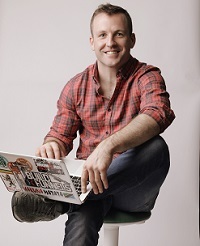 Pat Divilly is a best selling author and corporate speaker from Galway who features regularly in print media, radio and TV sharing his knowledge of physical and mental fitness. He has worked with some of the UK and Ireland’s best known companies in helping their staff increase productivity, wellness and ‘flow’. His most popular keynotes look at the areas of resilience, energy management and finding flow in business and life. After struggling with his first personal training business in Dublin and moving home to Galway, Pat started a small fitness bootcamp on his local beach which quickly grew into the largest fitness community in the country. Demand from outside of Galway for personal training led to Pat becoming one of the first Irish trainers to sell online personal training programs. Since May of 2012 over 20,000 clients have gone through his online training and nutrition courses. The growth of his business led to Pat being acknowledged by Facebook C.O.O. Sheryl Sandberg for his use of social media and being named one of Ireland’s Best Young Entrepreneur’s in 2014. Pat’s group have raised over €250,000 for local charities and recently built a primary school in Nepal. He has now emerged as one of the countries top up and coming corporate speakers, coaches and trainers and is available for keynotes and trainings in the areas of mental and physical fitness as well as resilience and energy management. To book Pat Divilly for your corporate event or to talk to us about your event requirements, either submit the enquiry form, email us: info@carolandassociates.com or call us on 087 718 1360.